Md. Inam Hamid from Delhi, B.E. - B.Tech Graduate. AUTOMOBILE TECHNOLOG.. AUTOMATION TECHNOLOG.. WEB DESIGN REVERSE OSMOSIS MULTI EFFECT EVAPOR.. EFFLUENT TREATMENT .. MICROSOFT OFFICE WO..
are one of expert skill area's of Md. Inam Hamid . Md. 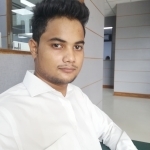 Inam Hamid is working in Production/Manufacturing/Maintenance industry.